Exclusively for You... a selection of special offers to tempt you! We want you to have a wonderful holiday with us and to make the most of all that is on offer in the area. Holidays are about treating yourself while you are away and with this in mind, we’ve worked hard to put a whole host of special offers together for you. We have arranged discounts at a variety of locations including pubs, restaurants, golf courses, adventure centres, local country stores and farm shops and even with a famous pottery manufacturer. Fancy a tour of a renowned, award-winning, local vineyard or how about a round of golf followed by afternoon tea? You could have an active family day out at a leading outdoor pursuits centre or a gentle tour around the countryside on an electric bike. Then you can relax and have a fabulous meal in one of the many wonderful pubs, bistros and restaurants we have here in Kent and Sussex – we’ve organised offers which we hope will make a meal out even better value for you. Once you've booked and paid the balance on your holiday cottage, you can log in to your customer zone and select the Holiday Extras & Vouchers tab where you will find a list of all of the exclusive offers. Simply select the ones that tempt you and either print out the relevant vouchers to redeem directly with the supplier or select the Redeem Online button which will take you to the suppliers website to book using your voucher code. We will be adding more offers all year round too, so when you book your holiday next year, there will be even more discounts for you to enjoy. Enjoy a glass of wine or a pint of local ale on the house with lunch or dinner. 81 Beach Street, Deal is a cross between a restaurant and a bistro offering great food with a continental twist and a lovely relaxed atmosphere. Betteshanger Park, near Deal, provides outstanding leisure and recreational facilities, miles of traffic free cycling, rugged mountain bike trails, woodland, grassland and marshland – all available daily for everyone to enjoy. Biddenden, Kent’s first commercial vineyard, is a third generation family run estate producing an array of award-winning estate bottled English still and sparkling wines, Kentish ciders and juices. It is open daily with a café and vineyard shop full of locally produced goods. Chapel Down, located just outside Tenterden, is England's leading winemaker producing a world-class range of sparkling and still wines, together with the award-winning range of Curious beers & cider. This great country store, just outside Cranbrook, has everything from country clothes and fashion, pet and animal foods, garden tools, gifts and much more. In the beautiful St Margaret’s Bay, The Coastguard pub is a seaside gem. With over 300 years under its deck, the pub holds onto its maritime heritage through a cosy nautical interior and dishes inspired by local produce. 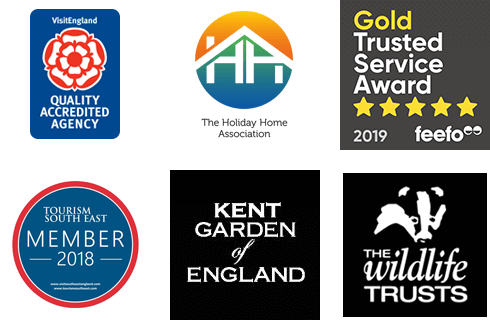 Elite Pubs in Kent and Sussex - The Great House in Hawkhurst, The Vineyard in Lamberhurst, The Poacher & Partridge in Tudeley, The Gun in Heathfield, The Farm House in West Malling or The Dirty Habit in Hollingbourne. The Granville is a fine dining pub just outside Canterbury, offering local beers and serving modern European food of the highest quality. Winner of the Britain's Best Roast Dinner Award 2016 for the South of England, as chosen by the Daily Mirror and British Roast Dinner Week in association with Colman's. Hush Heath Estate, Staplehurst is home to a state-of-the-art winery, acres of speciality vines and apple orchards. We produce award-winning sparkling wines to rival anything from the Champagne region, as well as sophisticated and refreshing still wines, and fresh fruity ciders. Travel on this lovely steam railway between Tenterden, Northiam and Bodiam, where you can visit the castle within easy walking distance. Macknade Fine Foods is the South-East’s leading food hall, built on a 170 year history of food, farming and retailing in Faversham. Hire a bike from Mike and make the most of the fantastic cycling along the Kent coast. Enjoy a glass of wine or a pint of local ale on the house with lunch or dinner (valid Monday to Thursday only). Princes , Sandwich Bay is one of the best championship links courses in a stunning coastal location. Rye Pottery is a contemporary, design-led company that is renowned for its beautiful homewares & unique decorative accessories, produced by hand in Sussex since 1793. Head to Faversham and visit Britain's oldest brewer for a tour of the brewery and entertaining tastings! Visit the UK Electric Bike Centre in Biddenden and try this unusual and exciting way of exploring Kent and Sussex - all the joy of cycling without the hard work! Visit The Vine right in the centre of the pretty Kent village of Goudhurst. Enjoy a pub meal with a pint, cocktails in the sumptuous cocktail lounge or a fabulous steak in the contemporary dining room. Farm Shop. Cafe. Destination. Eggs to Apples is your destination for over 50 local and global producers of fresh produce straight from the farm as well as artisan and culinary foods. Shop local, leave with a smile.